With our 1702 release we significantly enhance and simplify our capabilites to predict the best action and the right communication channel in marketing automation campaigns. Marketing experts can now assign rules on every action or follow-up trigger in a campaign in order to choose the right action or channel for each contact at the right point in time. 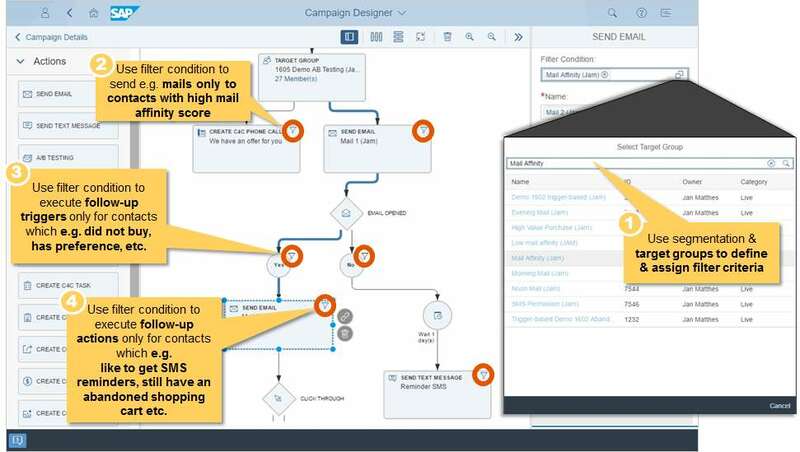 With this you can greatly increase flexibility to predict best action and accordingly route contacts during campaign automation. The calculation of the best time on the campaigns is only linked with the affinity segmentation block or how does the “Calculate Best Time” work?